Our friends at 15andmeowing and McGuffy’s Reader are taking a “paws” from fill-ins this week so we’re joining Feline Friday hosted by Comedy Plus, Create With Joy’s Friendship Friday and XMAS Dolly’s Show Off Tuesday. The Female Human and I had a little play time yesterday. Are you going to swing that toy or are you just going to sit there? I am fierce, I am a beast, beware of my moves! Fear the claws Human, fear the claws. Okay, I am done. You may leave now. 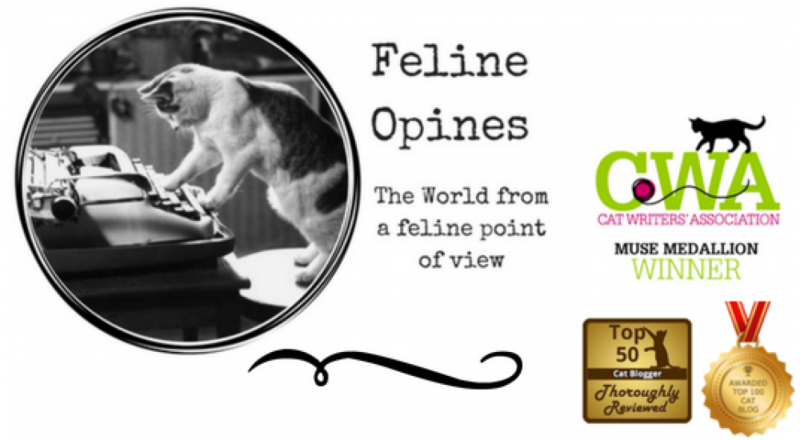 This entry was posted in cat behavior, Cat blogs, cats, Pet blogging, shelter cats, Top 50 Cat Bloggers and tagged big claws, big paws, black and white cats, felineopines, Oliver and The Tribe of Five, playing with your cat, The Tribe of Five by Feline Opines. Bookmark the permalink. Those were fun! In the third one I thought you were eating popcorn! I’ve tried it, meh. But butter, that’s an entirely different story. I’ll sneak up on the counter when the Female Human is distracted and take a few good licks. Nom! Oh Oliver, you are toooooo cute! Wand play is very fun, although if The Female Human doesn’t clip my claws soon it might get dicey.